From the Aerie - Our First Raptor Blog! Welcome to the BCC’s….bird blog? Yep, from time to time we will be writing about the birds who temporarily take over your crags (and the people who watch them). The Golden Eagles are back at Eagle Rock in Boulder Canyon, and they’re tending to an egg or two, so the crag and its approach trails are closed to climbing until July. Eagle Rock has been the preferred nest site for this nesting pair for several years running, and they have successfully fledged several eaglets from this nest. Although it’s a big nest—about 10 feet wide--we use a spotting scope and a fixed camera with a telephoto lens to see what’s happening up there. Our biologist, Rob Roy Ramey, confirmed incubation in early March, and that allowed rangers to re-open Blob, East Blob, Bitty Buttress and Security Risk Crags to climbing on March 19. The male and female eagles share the incubation duties. The female does most of the nest-sitting, keeping the eggs warm while the male hunts and brings food. But the female will occasionally hunt for herself, leaving the male in charge of the nest. Golden Eagle incubation takes 40-45 days, so we’ll start looking for a chick (or chicks) around mid-April. That’s when the observation gets really interesting, and the photos, if we’re lucky enough to get them--are much cuter. Stay tuned for fluffy white things! You guys know that raptors are near and dear to our heart here at the BCC. We want to help educate all climbers on where and when it’s okay to climb during the raptor nesting season. Our friends at the Access Fund are hosting a webinar on 3/12, tune in to find out more info. Access Fund's Policy Analyst, Katie Goodwin, and Natural Resources Senior Specialist/Wildlife Ecologist, Chelsea Bebe, will present on why seasonal raptor closures are important and the ways that the climbing community can partner with land managers to maintain long-term access to climbing areas. As always, you can keep up with the latest closure updates on our closures page here. Do you have a passion for climbing and are looking for a rewarding job within the climbing industry? Do you know someone who is? 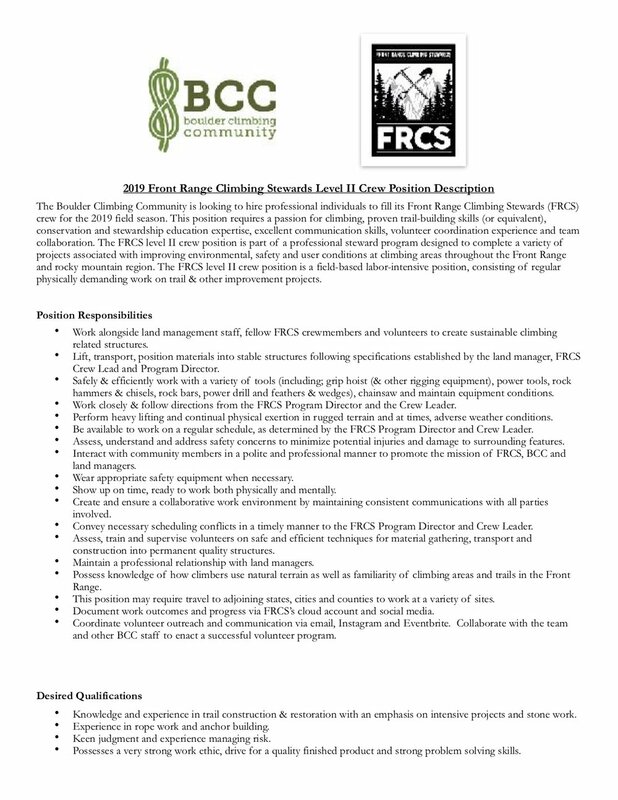 BCC is looking to hire crew members for the 2019 Front Range Climbing Stewards field season. Entry level and experienced trail builders are encouraged to apply for level I and level II positions. Check out job derscriptions and application information below. Wanna win $100 in free climbing gear? We’ve teamed up with the Salt Lake City Climber’s Alliance to launch a survey in an attempt to better understand our climbing community, and what YOU want to see from the BCC. The survey takes about 12 minutes to complete and you’ll be entered to win one of 3 gift cards to climbstuff.com for $100! The deadline has past but stay tuned for updates on board and volunteer opportunities. The Boulder Climbing Community is seeking several qualified candidates to join our Board of Directors. This is a great way to get involved and make a real contribution to our stewardship mission. Join us in celebrating our 2018 successes! Mark your calendar and dress up for our fancy fundraiser at The Studio featuring artwork, photography, climbing gear, guiding, and much more. Love climbing? Enjoy Avery beer? Want to support your local climbing community? Come to Rocktoberfest at REI Denver! We are celebrating the Front Range Climbing Stewards (FRCS) who have been working hard building local climbing access for years. Avery Brewing is bringing the beer and all proceeds support FRCS (to be clear...drink beer to support climbing access and stewardship). Things to get pumped about: a 5.13 climbing comp (more details and registration link below), music by Discosapien, local beer from Avery Brewing Company, climbing vendors, awesome giveaways, and a presentation by pro-climber: Jonathan Siegrist. This event is free to the public and we'll have an awesome vendor village with a silent auction (proceeds to the BCC/FRCS) and vendor clinics and giveaways. There will be climbing pros on hand doing clinics, stay tuned for the full schedule of clinics and demos. Come on out and celebrate climbing, stewardship and party with us! FOLLOW OUR FACEBOOK EVENT FOR UPDATES AND MORE! We need volunteers to help at this popular Clear Creek Canyon crag. Local business Butora has commissioned artist Katherine Homes to create this unique Boulder Canyon shirt. Buy one - all proceeds go to BCC for Boulder Canyon! Boulder Canyon is at the forefront of local climbing stewardship. The myriad and mixed land owners have prevented previous erosion control work of any magnitude. But in 2016 FRCS put in a month of work at Plotinus Wall, which sits on USFS land. Since much of the climbing is on USFS land, this was a ground-breaking project that opens the door to much-needed work throughout the canyon. Over the course of the last year, a new local climbing organization has formed with mentorship of the BCC. City of Boulder to begin temporary, free transit and parking changes at Chautauqua.